Good morning, friends! Welcome to my favorite day of the week…Tablescape Thursday. I hope that you are having a great week and enjoying this wonderful time of year. It is unbelievable how fast this month is flying by. It has been cold here in Oklahoma, and we may see some snow this weekend. My kids are really excited and have their fingers crossed that they will get to put their sled to good use. Today’s tablescape takes on an elegant theme. It is simple but pretty. I chose to use plain cream colored china accented with pops of red that can been seen in the accessories adorning the table. For the underpinning of the table, I chose a simple cream lace tablecloth. An antique clover table, that belonged to my Grandmother, serves as the perfect spot for serving tea. The Limoges tea set is over 100 years old and belonged to my Great Grandmother. I use this tea set often because its neutral color lends itself to being the perfect accompaniment to many different china patterns. For the place settings, I chose to use my Mikasa English Countryside mixed with the Limoges china plates and cream soup bowls. Each place setting is anchored by a linen cream placemat and gold charger plates. The crystal is Mikasa Golden Tiara. The centerpiece consists of a Christmas floral arrangement flanked by gold angels. Christmas greens and red baubles are scattered about the base. Thanks so much for stopping today. I hope that you have a Happy Thursday and a wonderful weekend! Merry Christmas!!! Elegant indeed…love how you placed the table that belonged to your Grandmother of the the tea service for serving your guests tea at the end of a perfect evening!….Love those gorgeous angels! Thank you, Shirley. I found the angels last year at Hobby Lobby and could not resist. I love angels! I hope that you are having a wonderful week. I can’t believe Christmas is almost here. I think all my shopping is finished and the gifts are all wrapped…fingers crossed! Merry Christmas!!! The angels on your beautiful table are gorgeous. Yes, your table is elegant and such a sweet “tea table” from your grandmother. Beautiful china too. Thank you so much, Judy for the sweet words! I hope that you are having a wonderful week! Merry Christmas!!! Dear sweet Veronica, I did not realize that you have a blog. I see your very sweet comments on my Facebook and always appreciate them so. Thank you so much for always being so kind to me. It has meant a lot. 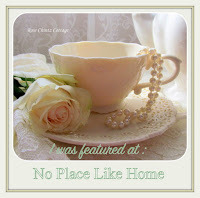 I just visited your beautiful blog, and was so touched by your last post. I feel that it was not only an appropriate Thanksgiving post, but also perfect for Christmas. I can tell by your writing that you have such a kind, caring, and loving spirit. You truly have a gift. I hope that you and your family have a very blessed and Merry Christmas Season!!! Shannon, it truly is an elegant table! From the gorgeous Limoges tea service to the beautiful angels on the table, everything is truly a feast for the eyes! Thank you so much, Pam! I hope that you have a wonderful weekend! This is so classic and beautiful Shannon! I adore the creamy white, gold and red combo. The amaryllis centerpiece is beautiful! Love the pretty gold angels and of course the Limoges pieces. Thank you so much, Liz, for the very sweet comment! I hope that you have a wonderful weekend!!! What a wonderful treasure to have your Great-Grandmother’s tea set. It is lovely and the fact that you use it and share it with your readers makes it all the more special. I also admire your lovely lace table cloth. I have similar gold rimmed china and your beautiful tablescape is inspiring me to have a dinner party for friends where I can use my china. I tend to entertain more casually these days since I have young grandchildren and the parents are more comfortable with the everyday dishes. I did start having tea parties with the grandkids at a young age using a little metal tea set that they love. Now I have started using a little porcelain one that they think is very special, and are being very careful with. I hope they will share my love of beautiful things so that one day they will treasure some of the items that are special to me. Thanks for your beautiful blog. Kathy, I was so happy to hear from you today! Thank you so much for your very sweet and kind words. How special that you have had tea parties with your Grandchildren. You are creating such wonderful memories that they will always treasure. I hope that you have a wonderful weekend. I remember you telling me that you live nearby. Be careful this weekend. I was just looking at the weather, and we are supposed to have 40 mph winds and blowing snow. Stay warm and take care. I hope that you and your family have a very Merry Christmas!!! I like how you repeated the gold of the angels in the charger, plate rims and glass rims. It is very pretty. The tea table is my favorite part. It seems to call for lingering a little longer at the end of the meal. Very pretty. Thank you, Lorri, for your very sweet and kind words! I hope that you have a week filled with lots of joy and happiness! Merry Christmas!!! Shannon, your table is very elegant. Your family and guests are going to feel very special dining at this table. Love the little side table with the tea service. How special that you have this set from your great grandmother. Merry Christmas! Thank you, Sarah, for your very sweet comment! I hope that you have a week filled with lots of joy and happiness! Merry Christmas!!! Very elegant. Love the angels! Thank you, Snap! I hope that you have a week filled with lots of joy and happiness! Merry Christmas!!! This certainly is a lovely and elegant tablescape and look at you with your little nearby table for serving tea..fancy! Thank you, sweet Chloe! Merry Christmas!!! You truly know how to set an elegant table. The white and gold-rimmed dishes are stunning. Judith, you are so sweet! Thank you so much for the kind words. I hope that you are having a most joyous week and that you and your family have a very Merry Christmas!!! Thanks for sharing at Monday Social. I agree with Judith. The table is gorgeous. The china is phenomenal. I hope you had a Merry Christmas.